Tatem Elementary School’s fifth-grade students got into the spirit of “Read Across America” week on March 6 by wearing t-shirts of places they’ve been on vacation. From left to right, top: Avery McMaster, Clara Duffey, Phoebe Alvarez, Leah Cedar, Ryann Tredinnick, Lauren Anton, Kaitlyn Kouser, Tatem principal Valerie Cline, William Ward, Max Devaney. From left to right, bottom: Luke Andresen, Garrett Needham, Pierce Hoffman. 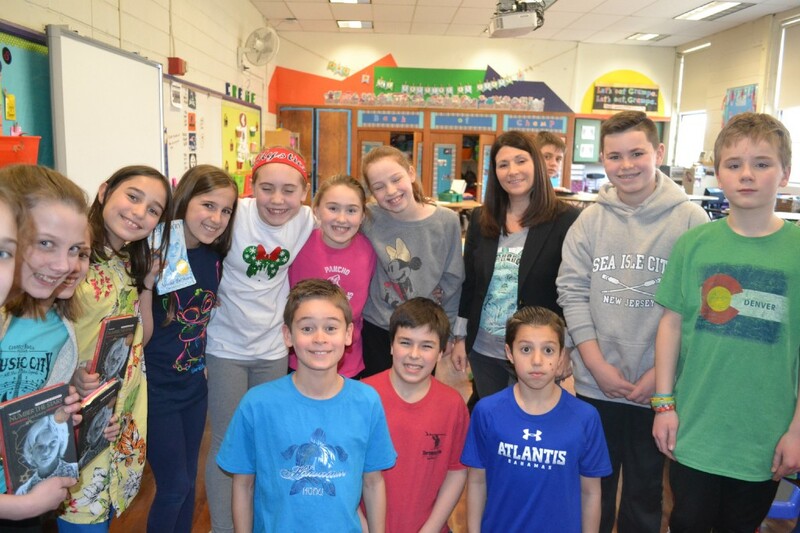 At Tatem Elementary School on Wednesday, March 6, students were in the midst of a summer mindset, wearing a “vacation shirt” to school and reading about different places throughout America. An initiative from the National Education Association, “Read Across America” has its roots in the celebration of Dr. Seuss’ birthday, which occurred on March 2, falling on a weekend this year. “The way we’re handling it this year is that our librarian, Sophia Nelson, along with some other colleagues of hers, created different kinds of activities to encourage literacy and to build a joy for reading. It touches my heart as a reading specialist and as a principal,” said Tatem Principal Valerie Cline. All week, Tatem students explored different parts of the United States. Each day focused on a specific geographic region, such as the Southwest, the Plains, the Southeast, the Northeast and the Northwestern regions. Teachers highlighted American authors from these diverse landscapes, while everyone involved celebrated the joy of reading. “Today, you can see I’m wearing my New York T-shirt because we asked the kids to wear a shirt from a vacation location around the country that they’ve been, to show we are truly reading across America and trying to highlight books that show different locations across our country,” Cline added. Tatem’s “Read Across America” celebration kicked off last Monday by asking kids to don their red, while and blue, while Tuesday’s sartorial challenge was a “crazy sock day,” along with a $1 donation to “Unforgotten Haven,” a Blackwood-based charity, which will be used to purchase new socks for those in need. On Thursday, the school looked to athletics and encouraged students to wear sports-themed attire to “Team Up for Reading” day, and the celebration concluded on Friday with a “Snuggle Up and Read” day where students were expected to wear pajamas and encouraged to bring a stuffed animal to read to. “What we’re doing is each day, we’re picking one author and we want to focus on diversity so we’re reading a book from them and then teaching the kids a little bit about their background. We’re having them complete a reading log also. Every day they’re supposed to read 20 minutes, and we collectively add up all the minutes, and if we reach 90,000 we’re going to get a reward at the end,” said Tatem kindergarten teacher Christine Parady. In a release sent by Cline previewing the week-long event, it was revealed a district-wide goal of reading a combined 90,000 minutes was set. If students collectively met that goal, they would be treated to a surprise by the elementary school principals and teachers. “We’ll have a secret assembly. We’ll have a special visitor come from a local sports team. It would be a mascot, so we’re trying to keep it under wraps for now,” Cline said. According to several sources from Tatem, the assembly would be scheduled for March 18.